Please keep in mind that the book was published in 1973 and it is even more pertinent today than ever and a lot has come from this since. "Plants are even sentient to orientation and and to the future. Frontiersmen and hunters in the prairies of the Mississippi Valley discovered a sunflower plant, Silphium laciniatum, whose leaves accurately indicate the points of the compass. Indian licorice, or Arbrus precatorius, is so keenly sensitive to all forms of electrical and magnetic influences it is used as a weather plant. Botanists who first experimented with it in London's Kew Gardens found in it a means for predicting cyclones, hurricanes,tornadoes, earthquakes and volcanic eruptions. So accurate are alpine flowers about the seasons, that they know when Spring is coming and bore their way up through the lingering snowbanks, developing their own heat with which to melt the snow. Plants which react so certainly, so variously, and so promptly to the outer world, must says France, have some means of communicating with the outer world , something comparable or superior to our senses. France insists that plants are constantly observing and recording events and phenomena of which man-trapped in his anthropocentric view of the world, subjectively revealed to him through his five senses-knows nothing. Whereas plants have been almost universally looked upon as senseless automata, they have now been found to be able to distinguish between inaudible to the human ear and color wavelengths such as infrared and ultraviolet, invisible to the human eye; they are especially sensitive to X-rays and to the high frequency of television. The whole vegetal world, says France, lives responsive to the movement of the earth and its satellite moon, to the movement of the other planets of our solar system, and one day will be shown to be affected by the stars and other cosmic bodies in the universe. As the external form of the plant is kept a unit and restored whenever part of it is destroyed, France assumes there must be some conscious entity supervising the entire form, some intelligence directing the plant, either from within, or from without. Over half a century ago France, who believed plants to be possessed of all the attributes of living creatures including "the most violent reaction against abuse and the most ardent gratitude for favors, could of written a Secret Life of Plants, but what he had already put into print was either ignored by the establishment or considered heretically shocking. What shocked them the most was his suggestion that the awareness of plants might originate in a supramaterial world of cosmic beings to which long before the birth of Christ, the Hindu sages referred as "devas", and which , as fairies , elves, gnomes. slphs and a host of other creatures , were a matter of direct vision and experience to clairvoyants among the Celts and other sensitives.The idea was considered by vegetal scientists to be as charmingly jejune as it was hopelessly romantic. It has taken the startling discoveries of several scientific minds in the 1960's to bring the plant world sharply back to the attention of mankind. Even so there are skeptics who find it hard to believe that plants may at last be the bridesmaids at a marriage of physics and metaphysics. Evidence now supports the vision of the poet and the philosopher that plants are living, breathing, communicating creatures, endowed with personality and the attributes of soul. It is only we, in our blindness, who have insisted on considering them automata. Most extraordinary, it now appears that plants may be ready, willing and able to cooperate with humanity in the Herculean job of turning this planet into a garden from the squalor and corruption of what England's pioneer ecologist William Corbbett would call a "wen." More from Cleve Backster mentioned in the Secret Life of Plants about biocommunication with plants on Coast to Coast with George Noory. I have to have Masaru Emoto and all he's done with water too. Our INTENT for our lives and how we effect ALL life around us is crucial for us to know. It will protect us because it empowers us and it will be beneficial to all LIFE ON EARTH aligned with it and we discover so much more than we ever realized as being ALIVE and CONSCIOUS like us. WE have no war with nature and earth and for those who do it starts with consciousness and it will end there too when they realize they don't have conscious control over those who have decided to exercise their own in what they will and will not allow. If we don't do this in consciousness first there is no point in talking about sustainability and being able to maintain such for very long. It's taking a stand and saying NO MORE to the fear mongers and NO MORE to those who think they have a right to control us and deliberately if not wantonly destroy life on this planet including water. Last edited by Shayalana on Sat Apr 25, 2009 5:09 pm, edited 1 time in total. This is a slide that I show at my lectures all over the world. Most of the concepts I seek to share with people are contained within this slide, so I would now like to explain the things I am saying with this slide. First, "Upper Class" indicates "King", an absolute monarchy both in old times and today. These are the capitalists, politicians, and scientists, who make up the system of power in the world. "Fire" indicates the material world and "Water" represents the spiritual world. Of course, "Public" means the general population. If the information that human beings are capable of knowing is 100%, then according to this slide currently the information we actually do know is only very small, as represented by the top portion of the iceberg. I am telling people the percentage of information we actually know is currently only about 3%. The genetic scientist from the University of Tsukuba, Japan, Prof. Kazuo Murakami explains this concept in his book, Divine Code of Life. He states in his book that the activation level of our DNA is currently around 3%. I am thinking along similar lines as Prof. Murakami. I am thinking the other unrevealed 97% is contained in Hado and water. Most of the things in the material world have been elucidated by the efforts of excellent capitalists or scientists. But the rest of the information out there, the 97% we don't know yet, I believe is found in Hado and water. The general population now needs to begin an investigation of this new area of information. A new "field" has to be established to elucidate these two things, and the creation of this field has to be through the people's collective efforts. It might be difficult to believe that the thinking level of humans can only be around 3% in this present age when we are living in a seemingly ultimate scientific civilization. However, if we think about our history in terms of the following example, you will begin to understand why this is so. The birth of the earth is said to be four thousand six hundred million years (4,600,000,000 years) ago, and the birth of human beings is said to be four million years (4,000,000 years) ago. Therefore, if we suppose the history of the earth is one year, the birth of human beings would be sometime on Dec 31st. Looking at the world in this way, we can say that the age of human beings is still very, very young. We are all still infants in the history of the earth. Let's now suppose that the four million years of human history is just one year, and think about where the position of 20th century is contained in that one year? Everyone would agree that we had an amazingly huge improvement in our scientific civilization during the last 100 years. But actually, it was only a 3% improvement because we have still only activated 3% of our DNA. This means we currently only use 3% of what the creator created in us. You might wonder why human beings are still at this 3% level, even though we have already had four million years of history, but we really should not complain about this. I think we should rather show our gratitude to those ancient people who worked very hard for human beings to survive and advance. I know there have been a lot of fearful things and sacrifices in the past, but when we think about how our life is now convenient when compared with the past, you can understand what I am trying to say. So let's give our gratitude to all of the capitalists, scientists, and politicians. In other words, let's affirm everything. With that in our mind, human beings must now begin on a journey to discover the rest of the 97% of DNA and information. In this 21st century we need to work to further build our culture, art and knowledge on shoulders of the foundation already laid down by our many advances in technology and science. This new journey will be very exiting, full of fun, and the true charm of mankind can now begin to emerge. As I said before, the keywords here are Hado and water. This e-Hado magazine is a community bulletin for all the 21st century people of the world who resonate with this new way of thinking. I would like to ask you to join us on this journey by sending in your ideas, and exchanging information with us. Let’s unite through our collective works, and work together to create a peaceful world with no wars for future generations. Please also ask your friends to join with us too. I find this man so refreshing , he reminds me of a brilliant child. I love his gentle, sweet,spirit. Water Crystal of the month having been exposed to a picture of a Cherry Blossom. Revolutionary New Discoveries About Water on Coast to Coast with George Noory interviewing David Sereda. Just to reinforce how powerful our intent is for our empowerment and how it effects our environment and how our environment's intent effects us. It's a 2 way transaction. It's astonishing how interconnected we all are as a Species. I understand why Lyricus says that the plants, animals and all life on this planet is seen as ONE. So its not just us humans, without the other lifeforms and consciousnesses we would never survive. They were here before we were so obviously don't need us. However, before the HMS, no doubt, it was very different than what being in the HMS has done to all life on this planet. Being in the HMS and tethered to its creators and now to those who have taken over has devastated the planet. They too are programmed if not more than we are and that is our saving grace in transcending them and stopping the madness. I read about this years ago and it changed my view on a lot of things and I grew my first garden with the ideas of consciously interacting with plants and nature and it grew from there. Again, we are powerful with our INTENT and it shows in our environment. How about being conscious of it and using it in conjunction with nature despite whatever is going on in the news. To be aligned with nature is that much more important now then ever. like the light of the sunrise falling on closed eyes. Open your eyes and experience the freedom of joy." Viktor Schauberger gave us so much about the nature of the nature of water and what is required to keep it pure and dynamic in our environment not to speak about all the other mysteries of nature resolved through him observing and cooperating with nature. I used to buy Kabbalaha water...which was glacier water blessed by rabis who had red-stings wrapped around their wrists that were exposed to the frequencies of Rachel's tomb and the chants of the Ana Bechoa...it cost four times what "dead" water cost, and I figured it was worth it because we are 80% water... Now after reading about dr Emoto's research (some years ago), I just bless my own cheap bottled water as soon as it enters my home and never give my mind a minutes' worry about if what I am consuming is dead or alive... tee hee...that's what I consider creative thinking. what if you could just leave it all behind except what you could carry and live anywhere... would you? That is how this nation was established... by self sustained people with vision...living by their wits, in harmony with nature. Nothing is impossible except that the state of your mind makes it so. In line with the topic of this thread. Have you guys checked out the Transition Town Movement? One of the reasons I find little time to participate in this forum is because of my involvement with this network. It emcompasses most of the things you've been linking to, and now in its fourth year here in the UK, is doing the 'viral spread' thing around the world, including US. Thanx Susana!!! This looks really interesting I'll check it out when I get home later. New Survival Seed Bank Lets You Plant A Full Acre Crisis Garden! I so appreciate how balanced this mans perspective is if not inspiring too. We could all do with a little of that. published in the last thirty years can refute that statement. are the programmers, and we need it within a few decades. but all that is changing. peace, water, hunger, conservation, human rights, and more. Corps, it works behind the scenes and gets the job done. Large as it is, no one knows the true size of this movement. loves us all in such a huge way. connectedness to the living world. if the evening news is usually about the death of strangers. origins, and very specific eighteenth-century roots. to life. I can think of no better motto for a future economy. that is based on healing the future instead of stealing it. is not a way to get rich, it is a way to be rich. and as numerous as the stars of heaven." this speech will end. You can feel it. It is called life. together to heal the wounds and insults of the past. we have gone way off course in terms of honoring creation. of your existence. Nature beckons you to be on her side. You couldn't ask for a better boss. as if your life depends on it. to Erica Linson for her help making that moment possible. This is the thread I was referring too star and it seems you have a lot of company in what you are doing. Good on ya all!!! Interesting because a guy was here to install some new cable for me for internet and we got talking. He's interested in getting together with people who want to do things like this so as to network with each other. We exchanged emails and will start a blog and do things with others locally. This way we can depend on each other and exchange with each other and not have to depend on the big corps for what we can supply ourselves, especially in food and knowing where it comes from and that it is pure. Yes!!!!!! After reading that the guy (26 yr old) who created facebook (Time's Man of the Year), and the third largest city in the world, and being aware that his "farm" game is the most popular form of entertainment for his citizens, it is evident that people do recognize the value of home food production and how it is profitable ... all I am trying to do is demonstrate how simple it is ... sure the start-up costs are somewhat prohibitive, but I have seen gardens start in milk cartons and plastic cups that would otherwise be thrown away ... and with the exception of the lights, which probably equal what you would spend in the market for imitation (Franken)veggies and can be reused year after year. One more "issue" (Monsanto) that you can put out of your mind. Having the garden protected from Chemtrails is another issue you can put to rest, knowing that your plants are covered and not being saturated by Aluminum and radio-active Barium ... picked by people who use the fields as toilets and may be spreading toxic germs on the the trusting public... not to forget how many people handle them in their process from hotbed to market ... you won't have to worry about "recalls" or supplementing your diet with expensive vitamins and minerals because you will be getting them in your food and you will find you eat less because your body's needs are being filled. but what I find gives me the most pleasure, is just watching things grow ... the AWE of it all - inspires a deep sense of appreciation for what we ARE (a part of) and how intimately we are integrated. Knowing that it all balances on "breath" (what we breathe out, plants breathe in - recycle and return as oxygen) ... and KNOWing that nothing wasted ...and everything is appreciated equally and with gratitude as we project the HVs into the circle of Life. The EPA on April 17 proposed new regulations to control carbon dioxide (CO2) and five other “greenhouse gases” as “pollutants” under section 202(a) of the Clean Air Act. While not mentioning what aspects of carbon-dioxide emissions will be regulated, the carbon dioxide emitted from automobiles and power plants is definitely on the regulation block. The first step toward costly and far-reaching regulations is that the EPA establish carbon dioxide as a regulatory “pollutant,” even though all plants need carbon dioxide for photosynthesis and all animals exhale carbon dioxide. In fact, about 8 percent of man-made worldwide carbon dioxide emissions are due to simple human breathing. The EPA says they do not want to regulate this activity … for now. But there's no chemical difference between CO2 emitted from a gasoline engine and that emitted from a human lung. Beekeeper Who Leaked EPA Documents: "I Don't Think We Can Survive This Winter"
Now the stakes are higher than ever. Tom Theobald's honey crop this year is the smallest he's seen in 35 years of beekeeping. "This is the critical winter for the beekeeping industry. I don't think we can survive," he says. "If the beekeeping industry collapses, it jeopardizes a third of American agriculture." That's because the giant agriculture industry couldn't produce nearly as much with native bee pollinators alone; instead, the industry relies on beekeepers, who rent out their bees to pollinate everything from strawberries and blueberries to squash and cucumbers. As of today, the EPA has no plans to ban clothianidin in the U.S. Theobald hopes that all the press surrounding the issue will trigger the agency to change its mind. It has to, he says. "The EPA management needs to step forward, face the music, take its lumps and do things right. If they continue to try to bury this, they're going to look more pathetic than they do already." People around the world are sensing that a global life-changing event is just ahead. Vivos is the life assurance solution for you and your family to survive the next devastating catastrophe that either nature or mankind may create. Our nuclear blast-proof shelters will provide you with up to one-year of autonomous underground survival, and a secure base to restart thereafter. Join our community of members with a boarding pass for space in a Vivos turnkey shelter. Vivos is a private network of survival shelters accessible only to its co-owners. Co-ownership of a Vivos shelter is priced from just $25,000* per person. To be considered as a co-owner, you must first become a member of Vivos. The Vivos Selection Committee evaluates each member applicant's profile for determination and candidacy of their membership. Vivos then selects the best candidates for co-ownership of each shelter from the current pool of active members. We first look for those individuals who may best contribute to each Vivos shelter community, providing the greatest chance of long-term survival of the entire group. Each co-ownership candidate is reviewed based on a number of criteria. As final candidates are selected, they are extended an invitation to purchase an interest in a specific Vivos shelter closest to their home area. Those selected candidates are then provided a reservation agreement to reserve their space in a specific Vivos shelter. Once a critical mass of reservations is received for each Vivos shelter, members holding a reservation then proceed to purchase their co-ownership interest. Escrow is then opened, construction and turnkey outfitting of their shelter is completed, escrow closes, and each owner is provided their co-ownership interest. * Effective March 15, 2011 Vivos will be priced on the Gold Standard. Question 16 from Project Camelot: What do you know about how successful the Powers-that-Be will be in surviving a pole shift or cataclysm in the underground bases that they have built for this purpose? than they can damage above ground. Those who believe they can manipulate Earth/Nature without consequence will learn otherwise. Last edited by Shayalana on Wed Mar 02, 2011 6:47 pm, edited 3 times in total. "The Girl Who Silenced The World For 5 Minutes"
Check this out its an idea for what one can do on their farm or acerage and engage others in a learning of that way of life if not procure an income in doing so. 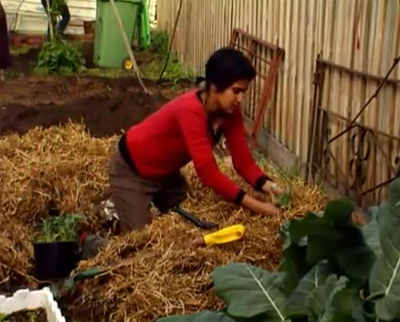 Permaculture is such an ancient science i love it.